Uncontrolled diabetes mellitus occurs when circulating insulin levels are inadequate to lower elevated blood glucose concentrations. This condition includes a spectrum of metabolic abnormalities that range from the effects of mild insulin deficiency (i.e., hyperglycemia) to the effects of marked and prolonged insulinopenia (i.e., ketoacidosis and fluid and electrolyte depletion). Diabetic ketoacidosis, which is the most severe acute manifestation of insulin deficiency, is almost entirely restricted to patients with type 1 diabetes, or those with severe pancreatic disease of other etiologies. In people without absolute insulin deficiency, although the combination of significant insulin resistance and relatively low levels of insulin can result in significant hyperglycemia, ketone body production sufficient to cause ketosis and metabolic acidosis does not occur. Even low levels of insulin, such as are typically present in type 2 diabetes, suffice to restrain lipolysis and limit the availability of free fatty acid precursors for ketone body formation. 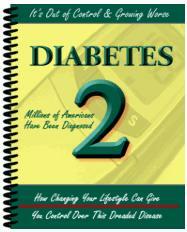 Otherwise, many of the derangements seen in uncontrolled diabetes are common to all forms of diabetes. The pathophysiologic events that affect blood glucose levels in states of mild-to-moderate insulin deficiency are classified into two broad categories. First, the normal pathways for glucose clearance after a meal are ineffective; second, body fuel stores are broken down with release of other substrates that lead to inappropriate synthesis of more glucose. These events are brought about by insulinopenia and often are further promoted by the relative abundance of the counterregulatory hormones, glucagon, catecholamines, and, to a lesser extent, cortisol and growth hormone. In addition, hyperglycemia further inhibits pancreatic 0 cell insulin secretion, compounding the problem (''glucose toxicity''). Following the ingestion of a meal, a substantial portion of the glucose absorbed into the portal circulation is removed by the liver, where it is stored as glycogen, converted to lipid, or consumed via energy-generating pathways. Each of these processes is decreased by insulin deficiency, resulting in increased entry of absorbed glucose to the systemic circulation. Skeletal muscle represents the main tissue site for removal of circulating blood glucose following a meal. In diabetes, insulin deficiency leads to a marked decrease in activity of the Glut-4 glucose transporter largely as a consequence of decreased insulin-stimulated Glut-4 localization to the surface membranes. This decreases the normal postmeal flux of glucose into skeletal muscle. In addition, glucose that does enter muscle is metabolized inefficiently in the absence of insulin. Other insulin-sensitive tissues, such as adipose tissue and myocardium, are affected in a similar manner, with consequent reduction in both glucose uptake and metabolism, although their contribution to glucose clearance is quantitatively less than that of muscle. 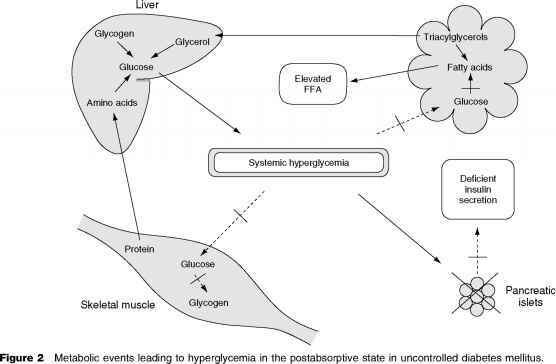 In postabsorptive or fasted states, hyperglycemia in uncontrolled diabetes does not resolve and often worsens (Figure 2). Abnormally low insulin concentrations lead to an exaggeration of metabolic responses that normally serve to protect against the development of hypoglycemia during fasting. These responses to low insulin and elevated counterregula-tory hormones include, initially, the conversion of stored glycogen to glucose. Simultaneously, the hepatic enzymes involved in gluconeogenesis are activated, which results in glucose production from such carbon sources as lactate and pyruvate (by-products of muscle glycolysis), amino acids (from muscle protein breakdown), and glycerol (derived from adipocyte triglyceride stores). With persistent insulin deficiency, glycogen stores are depleted, and hepatic gluconeogenesis becomes the most important contributor to the increasing hyper-glycemia. Meanwhile, body stores of protein and fat are being depleted in the futile synthesis of new glucose that cannot be used efficiently and serves to aggravate the existing hyperglycemia. Excessive glucose accumulation in the circulation and in the extracellular space leads to the movement of water out of cells to maintain osmotic balance, causing intracellular dehydration. The high filtered load of glucose at the renal glomerulus overwhelms the reabsorptive capacity of the renal tubule, and an osmotic diuresis results. Ultimately, this leads not only to water loss along with the glucose but also to excess excretion of potassium, sodium, magnesium, calcium, and phosphate in the urine. The magnitude of the total body electrolyte loss depends on the duration and severity of the hyperglycemia. The main symptoms with moderate insulin deficiency are polyuria and consequent thirst and polydipsia. With more severe and prolonged insulin deficiency, loss of large quantities of glucose in the urine can lead to weight loss. If hyperosmolarity is not compensated by an adequate increase in water intake, patients can develop altered mental status and obtundation. In elderly patients with type 2 diabetes, this sequence can lead to the life-threatening state of nonketotic hyperosmolar coma. In type 1 diabetes, the clinical picture of poor control differs from that described previously in that insulin deficiency is more severe (Figure 3). Glucose uptake by muscle is diminished, and glucose production by the liver is augmented. Marked insu-linopenia, however, also leads to rapid, uncontrolled lipolysis. Triglyceride breakdown results in accelerated release of free fatty acids and glycerol. The increased delivery of glycerol from adipose tissue to the liver further promotes hepatic gluconeogen-esis. In the absence of insulin, the liberated free fatty acids are taken up by the liver and converted at an accelerated rate to ketone bodies (fi-hydroxybutyric acid, acetoacetic acid, and acetone). 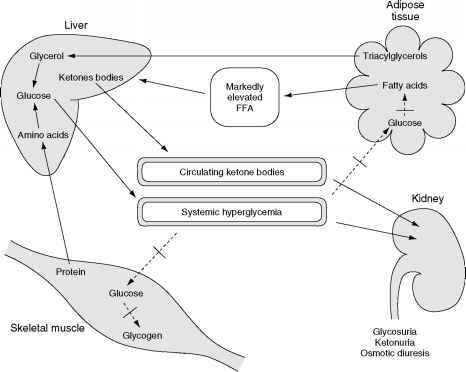 In the fasting state in nondiabetic individuals, ketone bodies are metabolized under the influence of even low levels of insulin as a source of energy, particularly in skeletal and cardiac muscle. In extreme insulin deficiency states, ketone body utilization is inhibited at the same time that synthesis is increased. With increasing duration of insulinope-nia, the ketoacid levels in the bloodstream rise. Ketones, like glucose, spill into the urine, either as free acids or, depending on the pH, as sodium or potassium salts, worsening the osmotic diuresis and electrolyte deficiency. Eventually, the blood buffering capacity for acid is overwhelmed and systemic acidemia occurs. Acidemia has a deleterious effect on all cell membranes and many cellular functions and, when severe, can cause arrhythmias, cardiac depression, and vascular collapse. In combination with the previously described hyperosmolarity and dehydration, diabetic ketoacidosis is a life-threatening situation. In summary, poor control can lead to dangerous metabolic consequences and, occasionally, death. A primary goal of therapy is insulin replacement, which is needed to reverse the production of glucose and ketoacids by the liver, to promote muscle glucose and ketone body uptake, and to inhibit further breakdown of fat and protein. An equally important goal of therapy should be the replenishment of lost extracellular and intracellular fluids and electrolytes. Figure 3 Metabolic events leading to the development of ketoacidosis in uncontrolled diabetes mellitus. 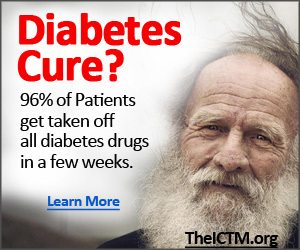 See also: Diabetes Mellitus: Etiology and Epidemiology; Dietary Management. Glucose: Chemistry and Dietary Sources; Metabolism and Maintenance of Blood Glucose Level; Glucose Tolerance. Liver Disorders.